This property is a 11-minute walk from the beach. City Krug Apartment offers accommodations in Budva, just 38.6 km from Podgorica. City Krug Apartment features views of the sea and is 16.1 km from Kotor. Bar is 30.6 km from City Krug Apartment, and Sveti Stefan is 5.8 km away. Tivat Airport is 16.1 km from the property. The kitchen is equipped with an oven, stove top, refrigerator, oven and water kettle. A flat-screen TV is provided. 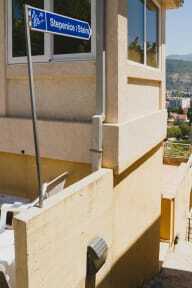 The apartment also features a balcony with a view over the sea and a city of Budva.